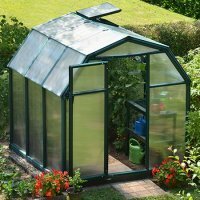 Rion Eco Grow® is a premium greenhouse with excellent heat retention. Its barn shape design provides large headroom for work comfort. The green resin PVC frame and virtually unbreakable twin-wall glazing both contribute to outstanding insulation and create a unique nurturing environment. The greenhouses’ twin-wall glazing retains heat and diffuses light to protect from strong sunlight exposure. The durable frame easily snaps together using smart ‘Pin & lock’ connectors and enables the structure to withstand extreme weather conditions for many years of gardening use. Rion Eco Grow® is a premium greenhouse with excellent heat retention. Its barn shape design provides..